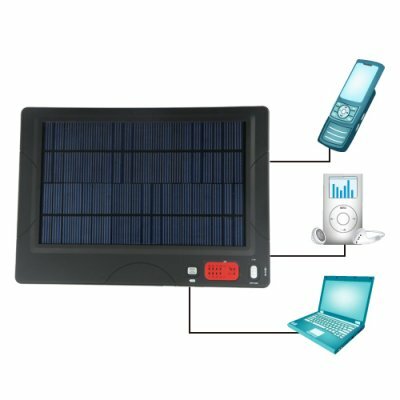 Successfully Added High Capacity Solar Charger Battery for PC Laptop + Mobile Phone to your Shopping Cart. 20000 mAH portable solar charger and battery for recharging your laptop PC or mobile phone anywhere. Our Exclusive model - High Capacity Solar Charger Battery for PC Laptop + Mobile Phone - is the perfect green gadget for the modern traveler! Either plug this laptop and cell phone accessory into your car or a wall plug to quickly recharge the battery, or go all green and convert solar energy to electrical energy. This is a multi use item that lets you recharge anything from 5V products such as your ipod or mobile phone, to almost any 16V ~ 22V laptop, and with the incredible amount of included adapters, you will never have to worry about which product you plug in. Simply select the current for your product, attach the correct adapter, and watch it charge. This is a perfect device for anyone in the wild, at home, or just about anywhere you can think of, and comes with Chinavasion's one year warranty and super low wholesale savings. Battery with solar energy recharge for today's most popular cell phones and laptops. This portable power source can be recharged quickly via AC adapter or via the sun when you plan your recharging schedule ahead. on 2009-07-01 00:26:34 A great product for people on the go. Every person whose lifestyle and career keeps them on the move needs this solar charger. Saves you the trouble of carrying the heavy mains charger or looking for socket and power adaptors in a new place, and you can work anywhere mains or no mains. Works fine and I'm very pleased with it.